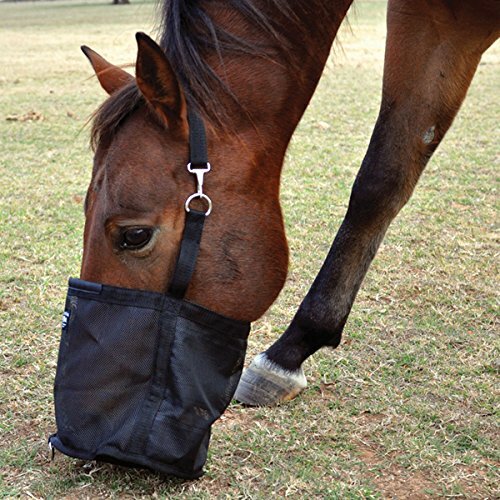 Spillproof design, eliminates feed waste due to sloppy eating, bullying, and head tossing. Cashel feed rite bag eliminates feed waste due to sloppy eating, bullying, and head tossing. During feed time, it stops the fighting with multiple horses, lets all horses get their ration, helps hard to catch horses, and relaxes nervous horses. No grain is wasted with a spillproof design. Constructed of sturdy breathable coated mesh, adjustable strap, durable snap and elastic straps that retract as grain is eaten. White tag to mark the horse's name for convenience.